Penises," is a one-man "comedy in two acts"
Doors open at 6:30pm. Tickets will be available for purchase at that time. Evolvefish merchandise should also be available. Victor J. Stenger, Author of the New York Times best seller “God: The Failed Hypothesis” will be speaking in the Turnhalle at the Tivoli on the Auraria campus on November 10th from 1:00-3:00pm. After his presentation copies of his book will be available for purchase and signing. The address is 9000 Auraria Parkway, Denver Colorado, 80217. So, right now there is a Denver ballot initiative for and “Extraterrestrial Affairs Commission”. I’ll be calling it EAC for short. You can check out the campaign website here. According to the campaign site, 57 extraterrestrial humanoids have been classified, the government has not only conspired to cover up the presence of extraterrestrials but the clean energy technologies they have offered us as well, and that photos from NASA are doctored to remove evidence of extraterrestrial life. For the evidence of these claims, they give a link to the Star Trek Institute The Disclosure Project, a non-profit organization dedicated to uncovering the truth about our alien life. The Men In Black big bad U.S. government, though, is standing the way. Here is a copy of the bill itself. If your from Denver, I urge you attend David Grinspoon’s lecture on the ballot initiative before you consider voting for this bill. 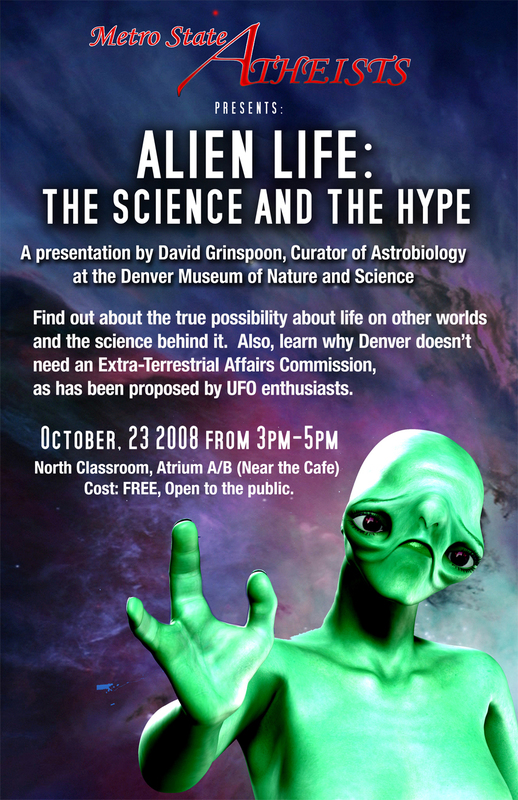 The title of his lecture is “Alien Life: The Science and the Hype: Why Denver Doesn’t Need an Extraterrestrial Affairs Commission”. David Grinspoon is the curator of astrobiology at the Denver Museum of Nature and Science, author of “Lonely Planets” and “Venus Revealed”, and winner of the Carl Sagan Medal. The lecture will be on the Auraria campus, 9000 Auraria Parkway, Denver CO 80217, in the North Classroom Atrium A/B from 3pm to 5pm on October 23rd. His personal web page is David Grinspoon’s Word. Metro State Atheists is hosting the event, the Center For Inquiry will be co-sponsoring, and Elles of Splendid Elles will be presenting David Grinspoon. Victor J. Stenger, Author of the New York Times best seller “God: The Failed Hypothesis” will be speaking in the Turnhalle at the Tivoli on the Auraria campus on November 10th from 1:00-3:00pm. The address is 9000 Auraria Parkway, Denver Colorado, 80217. Check out the abstract of his talk and a short biography below. In my 2003 book Has Science Found God? I provided a critique of contemporary claims that science supports the existence of God and found them inadequate. In this book I go much further and argue that empirical science makes a strong case against the existence a God with the traditional attributes of the Judaic-Christian-Islamic God. My argument will not be based simply on the gross absence of evidence for God. Not only is there no evidence for God, I will argue that the evidence we have can be used to conclude beyond a reasonable doubt that this God does not exist. Not only does the universe show no evidence for God, it looks exactly as it would be expected to look if there is no God. God: The Failed Hypothesis made the New York Times bestseller list in March 2007. The paperback edition is now available, with a foreword by Christopher Hitchens and a new Postscript by the author. Victor Stenger is adjunct professor of philosophy at the University of Colorado and emeritus professor of physics at the University of Hawaii (retired). He is a fellow of the Committee for Skeptical Inquiry and a research fellow of the Center for Inquiry. Stenger has also held visiting positions on the faculties of the University of Heidelberg in Germany, Oxford in England (twice), and has been a visiting researcher at Rutherford Laboratory in England, the National Nuclear Physics Laboratory in Frascati, Italy, and the University of Florence in Italy. Stenger spent forty years doing research in elementary particle physics and astrophysics during the golden age of those subjects. In his last project before retiring, Stenger collaborated on the underground experiment in Japan that showed for the first time that the neutrino has mass. The Japanese leader of this experiments shared the 2002 Nobel Prize. Victor Stenger has had a parallel career as an author of critically well-received popular-level books that interface between physics and cosmology and philosophy, religion, and pseudoscience. These include: Not By Design: The Origin of the Universe (1988); Physics and Psychics: The Search for a World Beyond the Senses 1990); The Unconscious Quantum: Metaphysics in Modern Physics and Cosmology (1995); Timeless Reality: Symmetry, Simplicity, and Multiple Universes (2000); Has Science Found God? The Latest Results in the Search for Purpose in the Universe (2003); The Comprehensible Cosmos: Where Do the Laws of Physics Come from? (2006); and God: The Failed Hypothesis. How Science Shows That God Does Not Exist (2007). The latest book made the New York Times bestseller list in March, 2007. 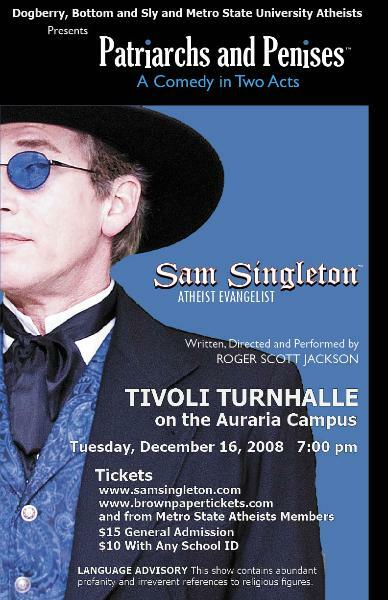 Stenger maintains a popular Web site (a thousand hits per month), where much of his writing and the slideshow for this talk can be found, at http://www.colorado.edu/philosophy/vstenger/ .